FCA employee rulings now make it simpler for workers to expose financial wrongdoing. Whistleblowers can 'blow the whistle' to reveal industry misconduct around the United Kingdom. BLOWING THE WHISTLE: FCA is the Financial Conduct Authority in Britain. They implemented a range of new rules designed to make it much easier for workers to 'blow the whistle'. The new rules come into force from September 2016. It will be simpler to report any misdemeanours or corruption identified throughout institutions. They will require institutions to inform the Financial Conduct Authority any time they lose an employment tribunal involving a so-called 'whistleblower'. Company boards must also attend a yearly presentation. 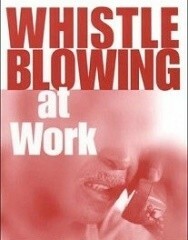 It must cover the subject of whistleblowing for employees in the workplace. There are several objectives in the new rulings. It should prevent employees being hesitant or afraid to report financial misconduct. They should come forward and disclose unethical transgressions in firms. There are reports of employees getting sacked for their role in exposing improper trading practices. This seems to be prevalent in the banking sectors of the United Kingdom. The new regulations bring the UK into line with the Securities and Exchange Commission in America. But, none of the rules introduced have yet targeted the payment of informants - which do exist in the US. A spokesperson for the Financial Conduct Authority gave a statement. He said: "It is in the interests of the industry and regulators alike that wrongdoing gets identified and addressed promptly. Individuals must have the confidence to come forward. Thus, it is vital that firms have in place adequate policies on dealing with whistleblowers". UK firms must appoint a senior manager recognized as a 'whistleblowers' champion'. Institutions must set up internal arrangements to deal with all forms of whistleblowing for all types of people. Settlement agreements and employee contracts must contain certain text. It should outline the fact that workers have a legal right to blow the whistle. Employers must inform UK based employees about the whistleblowing services provided by the Financial Conduct Authority and the Prudential Regulation Authority (PRA). A presentation about whistleblowing procedures must take place for the company's board at least once per year. Firms must inform the FCA if they lose an employment tribunal with a whistleblower. The whistleblower at work rules come into effect in September 2016. The creation comes in conjunction with the Prudential Regulation Authority (PRA). Incoming regulations will apply to any firm taking deposits and those with assets in excess of £250 million. Gender Pay Gap Declarations: Firms begin declaring wage imbalance paid to males and females. Nursing Immigration Rules: UK to allow 1000's of Indian nurses onto the 'shortage occupation list'. Safety Records at Work: Great Britain claims one of the best workforce safety records across Europe. Workplace and Benefits News Articles: Key headlines about working regulations and benefit rulings.